Craig Mackail-Smith's late winner helped Luton to a first home win of 2016 over struggling Hartlepool. After a dull first half, Cameron McGeehan's penalty following Nicky Featherstone's handball gave the home side the lead. Adam Jackson soon headed in Jake Gray's cross to levelled proceedings. But, with minutes remaining, substitute Mackail-Smith lobbed in his first goal for five months to steal the victory for Luton. Match ends, Luton Town 2, Hartlepool United 1. Second Half ends, Luton Town 2, Hartlepool United 1. Attempt missed. Carl Magnay (Hartlepool United) right footed shot from outside the box is too high. Attempt saved. Jake Gray (Hartlepool United) left footed shot from outside the box is saved in the centre of the goal. Danny Green (Luton Town) wins a free kick in the attacking half. Goal! Luton Town 2, Hartlepool United 1. Craig Mackail-Smith (Luton Town) right footed shot from the right side of the box to the bottom left corner. Assisted by Scott Cuthbert. Substitution, Luton Town. Pelly Ruddock replaces Stephen O'Donnell because of an injury. Craig Mackail-Smith (Luton Town) wins a free kick on the left wing. Corner, Hartlepool United. Conceded by Jake Howells. Substitution, Luton Town. 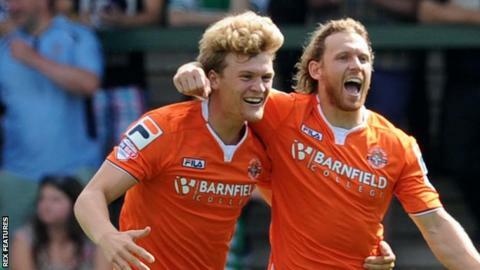 Craig Mackail-Smith replaces Joe Pigott. Attempt missed. Billy Paynter (Hartlepool United) right footed shot from outside the box is close, but misses to the left. Billy Paynter (Hartlepool United) wins a free kick on the left wing. Substitution, Luton Town. Ryan Hall replaces Alex Lawless. Corner, Luton Town. Conceded by Adam Jackson. Goal! Luton Town 1, Hartlepool United 1. Adam Jackson (Hartlepool United) header from the centre of the box to the bottom left corner. Assisted by Jake Gray with a cross following a corner. Attempt saved. Nathan Thomas (Hartlepool United) right footed shot from outside the box is saved in the bottom left corner. Goal! Luton Town 1, Hartlepool United 0. Cameron McGeehan (Luton Town) converts the penalty with a right footed shot to the bottom left corner. Penalty conceded by Nicky Featherstone (Hartlepool United) with a hand ball in the penalty area. Corner, Hartlepool United. Conceded by Stephen O'Donnell.